Embrace cream. Really. Try it. The jar is cold, but it feels good to make nice with your cream. 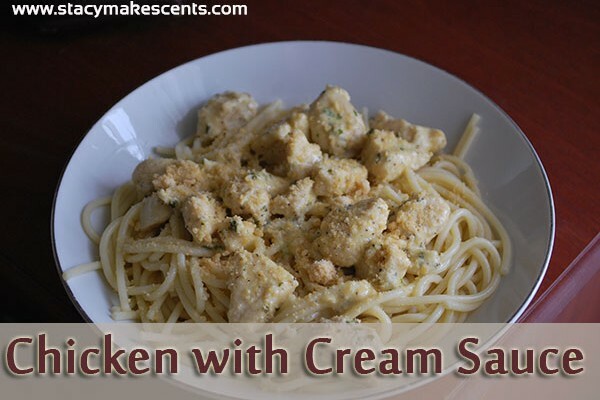 It does such wonderful stuff: it makes ice cream; it makes BUTTER; it tastes good in coffee, and it makes THIS…Chicken with Cream Sauce. Go ahead. I’ll wait. Hug it. I dare you. I’m really enjoying this Cooking Through Stacy’s Stash and making new recipes for y’all to try out. It challenges me in the kitchen…but every day is a challenge for me in the kitchen. I do dumb stuff daily, so I’m a challenge in myself. Oops? Does this paragraph even make any sense? If you know me, you know I have this thing for Pioneer Woman. Really. Barry says she’s my girl crush. When I first found her blog, I spent DAYS (yes, DAYS) reading everything. Since then, I haven’t really had the time to do that…but I still get her emails and I LOVE her recipes. I have both of her cookbooks and I’ll buy any more than she puts out. I also have her Black Heels to Tractor Wheels book (Pssst! Big Brother! That’s my affiliate link.) – excellent read. This is the first cookbook she put out – and I love it. Every recipe I try is excellent and makes my belly happy. 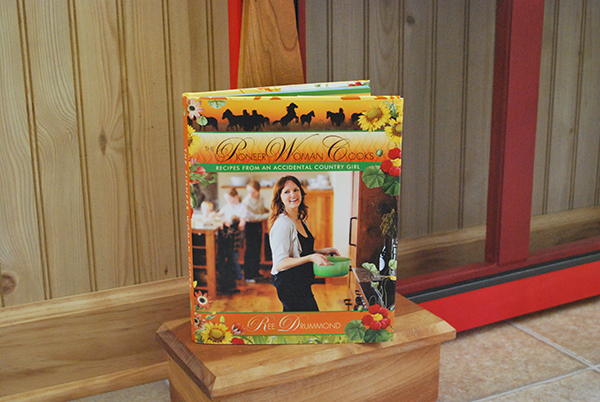 You should add The Pioneer Woman Cooks to your collection if you like good food – and cookbooks with pictures. The pictures in this cookbook are rockin’ awesome. They’ll make you slobber. I have this thing against clams…I don’t eat them. They never did anything wrong to me – they didn’t hurt my feelings…I just won’t eat them. They make me shiver and wanna yak. Sorry if I’ve ruined that for you, but it’s true. 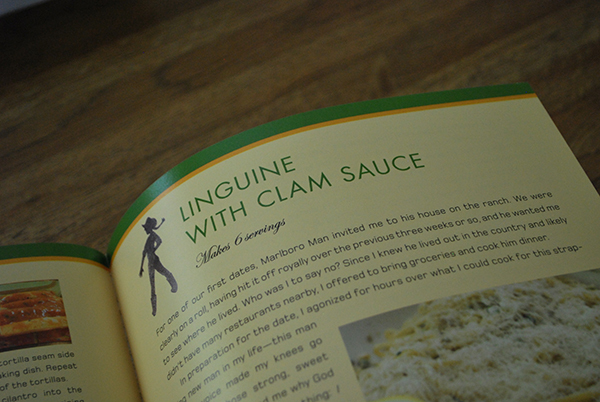 However, I knew this recipe for Linguine with Clam Sauce had GREAT potential…so, I use re-made it – Stacyfied it. Again. I once had clam juice in a dish I tried to make called Shrimp Pot Pie. I think that forever ruined seafood for me. Kiss it good-bye, buddy. That was the WORST dinner to ever be made in my kitchen. I still have nightmares about it. No more clams for me. 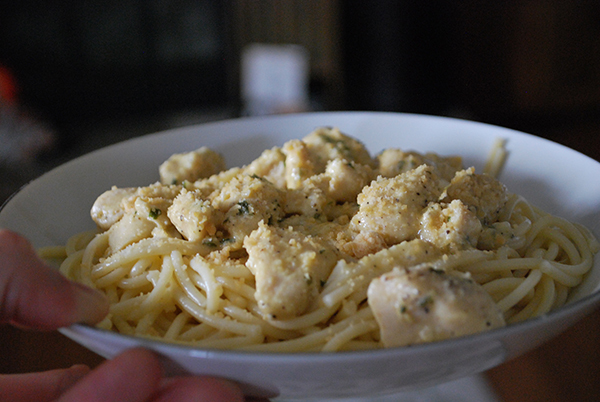 I switched it up and added chicken to this instead…and chicken broth instead of wine…and spaghetti instead of linguine. So, I guess this really isn’t Pioneer Woman’s recipe anymore. Now it’s Stacy’s. But really, who cares? All I know is that it’s stinkin’ delicious and Barry wanted to eat it twice. I have those meals often…when I wish I could just start dinner over and re-consume all that I just ate because it was so delicious. But that would require puking. And since I haven’t puked since 8th grade, I’m not willing to break my record. This dish only serves four, but it’s easily doubled or halved. Also, there isn’t a TON of sauce. Just barely enough for the noodles…which is how we like it up in here. Y’all gonna make me lose my mind, up in here, up in here. I have no idea why I sing that song all the time, but I do…just go with it. In a skillet, melt butter. Add chicken. Season with salt, pepper, and garlic. Cook until done. Add broth and turn up heat until the liquid starts to reduce. Reduce heat and add lemon juice. Add parsley and cream. Stir. Cook until the mixture starts to thicken. Drain noodles and toss with cream sauce. I made this last night. My husband took one bite and said “This sauce is amazing, and there isn’t nearly enough of it.” Looks like we have a keeper, as long as I double the sauce next time! I made this last night and my hubby went nuts over it. I will need to double the recipe next time so we both have leftovers the next day. I adore cream. And anything with cream sauce and pasta is my friend! Great spin, Stacy! I love clams and this dish sounds better with chicken… thanks for sharing it with us on foodie friday. This sounds like my kind of recipe. Anything with cream in it, and I’m good! 🙂 Thank you guys for helping it be a success! I made it last night and yummo! Since I used my last lemon on some THM Lemon Pudding I had to do without lemon. Perfect and everyone in my family loved it! Thank you for sharing and hosting the THM Linkup!! This caught my eye right away on Wellness Wednesday. 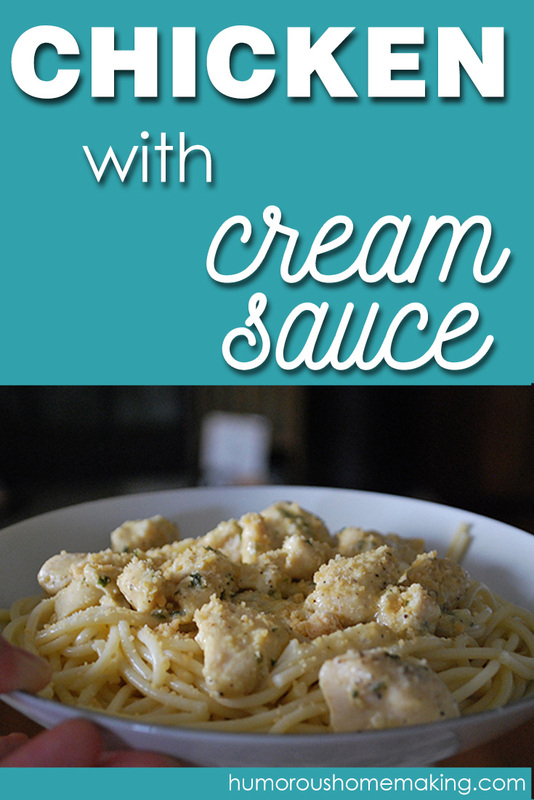 I love cream sauces! I would have cried my eyeballs out. I also love PW’s first cookbook. I’ve never looked through the second, but had great luck with all the recipes I tried from the 1st. Unfortunately, when my family moved to Italy for a few months, I took that cookbook with me (knowing the group I’d be cooking for would LOVE it) and left it there. Thankfully, most of those recipes are on her site. Iny’s Prune Cake was by far my favorite. 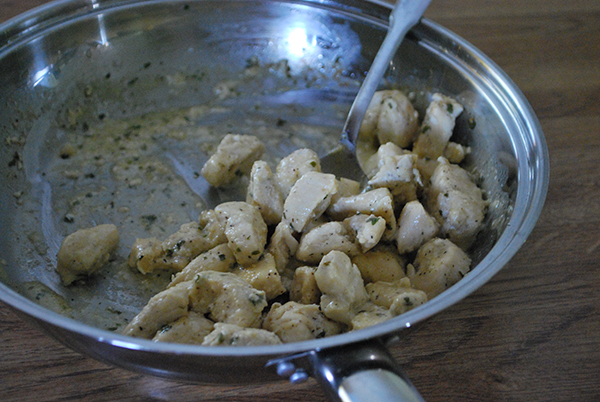 I made this tonight … substituted rice for pasta, and added chopped mushrooms because I had some of both leftover. Added a side of broccoli and cauliflower. YUM! This is a really nice recipe! Kids (aged 21 –> 6) loved it too! Definitely a keeper! This looks so yummy – I will have to try it. Stopping by from Wednesday Whatsits. Thanks also for visiting my blog. 🙂 You’re welcome! Thanks for hosting. I really REALLY love Spaghetti Squash. Bacon. How I love thee. Thanks for another link-up! One word: BACON! Looks super good. I’ll have to try it with spaghetti squash since we’re GF but it should be yummo! I was reading through the guidelines. Is it ok to post a THM giveaway?